The 2018 PyeongChang Olympic and Paralympic Winter Games became the winner of the best multi-sport event of the year at the SportsTravel Awards which took place in Louisville, U.S., on Oct. 4. 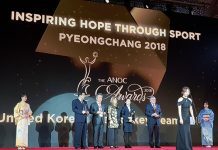 The 2018 PyeongChang Olympic and Paralympic Winter Games were named as the best multi-sport event of the 2018 SportsTravel Awards. The U.S. sports magazine SportsTravel announced the PyeongChang Games as the winner in the best Amateur Multi-Sport or Multi-Discipline Event category of the SportsTravel Awards at the “Teams 2018 Conference & Expo” in Louisville, the United States, on Oct. 4. It was the first time that the Olympic Games won the award since the London Olympic Summer Games 2012 six years ago. The winners of the award have been selected from online votes by the magazine readers and other online users. “It made remarkable world-level achievements not only in cultural, business, environmental and IT areas but also in inter-Korean relations as the ‘Peace Olympics’,” he said.